Today is the big day! I’ve been decorating like a Christmas Ninja Elf for the past two weeks and am so excited to show you my Winter Woodland Glam Christmas Home Tour! 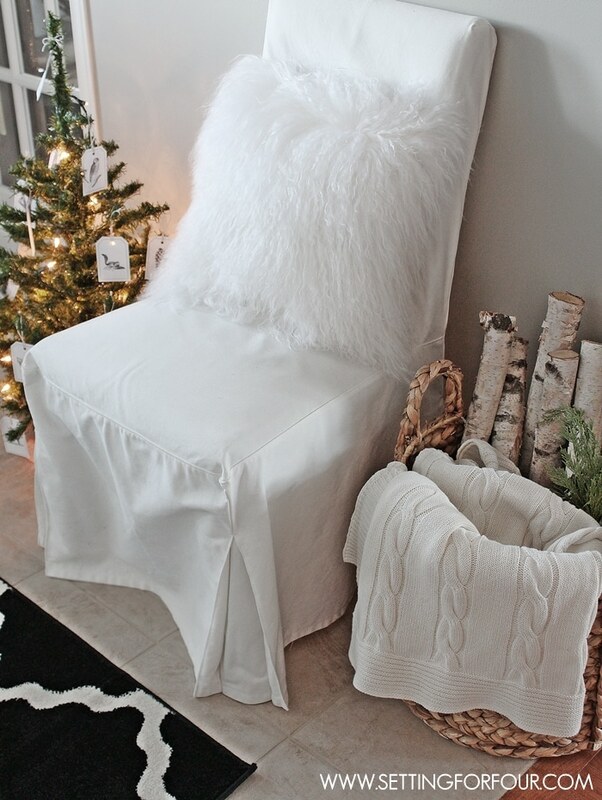 Grab a cup of hot cocoa or coffee and your comfiest chair – I’ll show you all my holiday decorating ideas and tips! 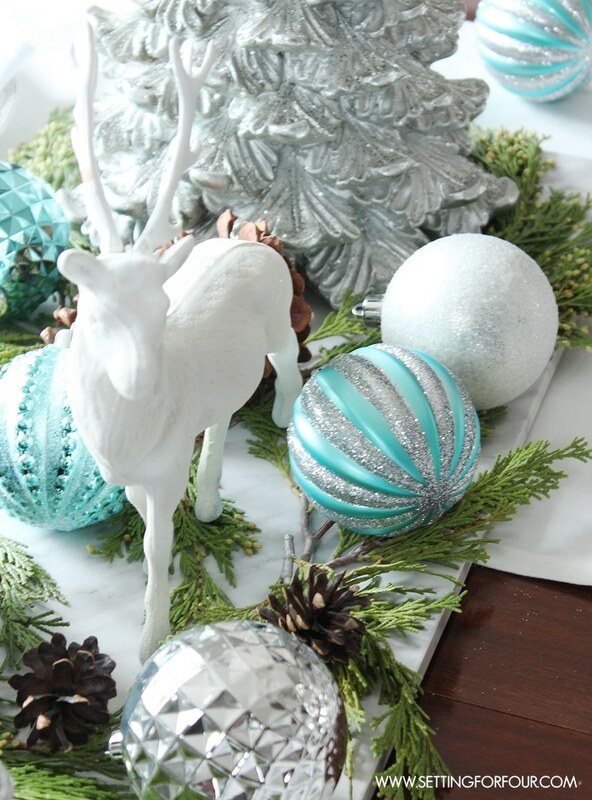 This year my holiday home decor is all about ‘Winter Woodland Glam’! The neighborhood I live in is called ‘Deer Run’, named from all of the pine and cedar forests and white tailed deer that live here. 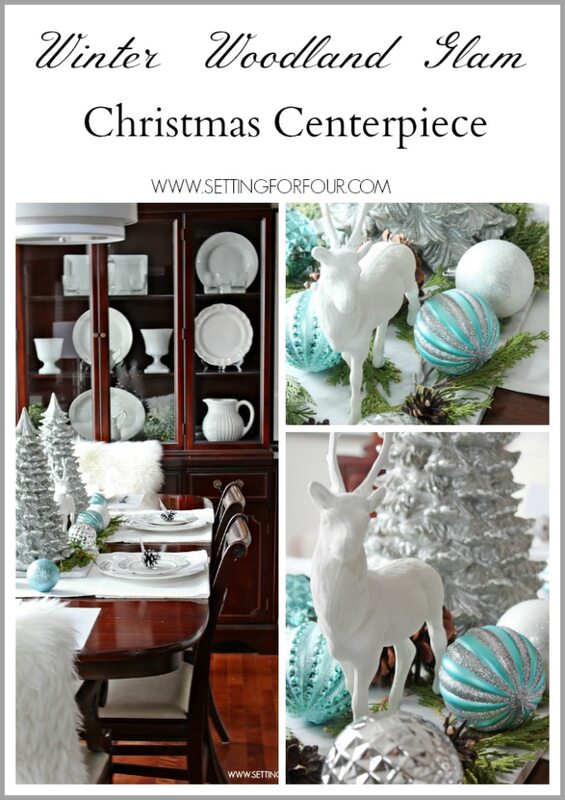 I was inspired by my wooded surroundings and the woodland animals to create a Winter Woodland Glam style for my home this holiday! It includes serene wintery colors, rustic woodland references, natural textiles and texture mixed with glamourous metallics, shimmer and shine! 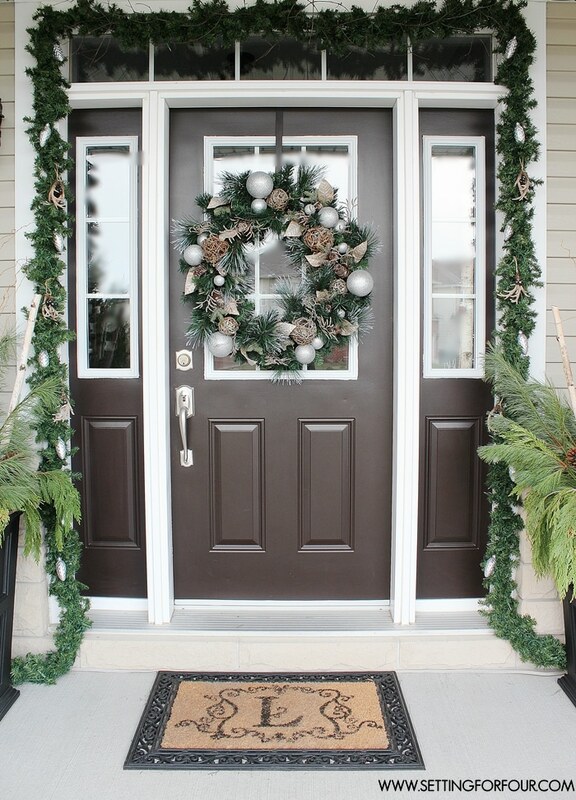 I decorated my Winter Woodland Entryway with two large pine, cedar and birch filled urns, pine garland filled with twigs, silve pine cones and deer antler ornaments and this beautiful holiday wreath! Come on in to my Foyer! I’ve added some birch branches from the woods behind our home, a large basket and a miniature Christmas tree with twinkle lights! I love this Mongolian fur pillow – so incredibly soft! 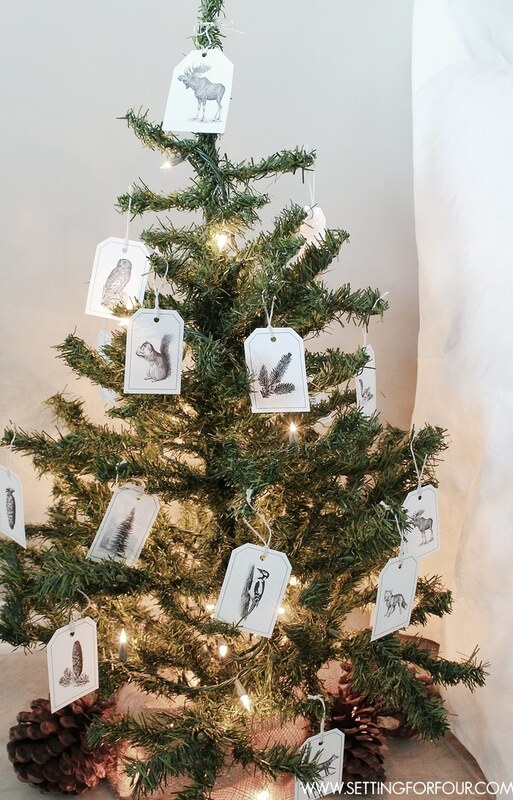 I decorated this little tree with DIY handmade tags that feature vintage images of woodland animals….owls, deer, fox, squirrels, woodpeckers, moose and bears. These DIY ornament tags are so easy to make – tutorial coming soon! 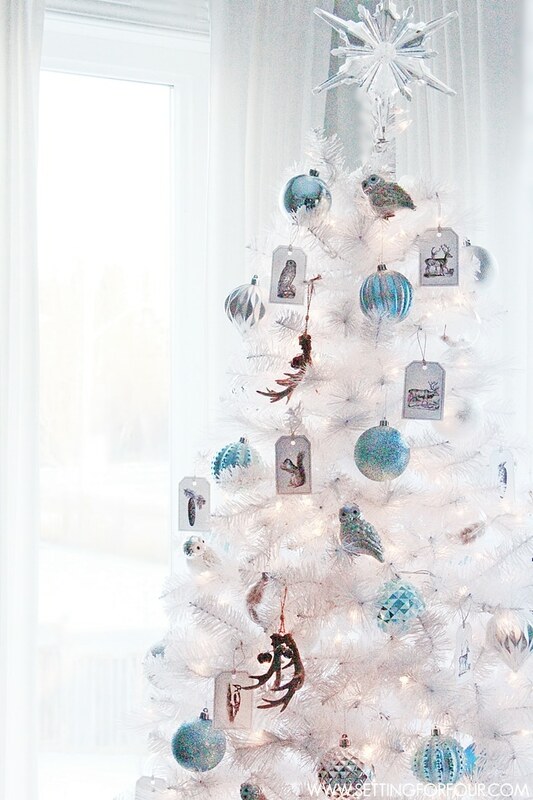 Birch branches and white painted twigs with more DIY Vintage Tag Ornaments add another touch of winter woodland holiday style! 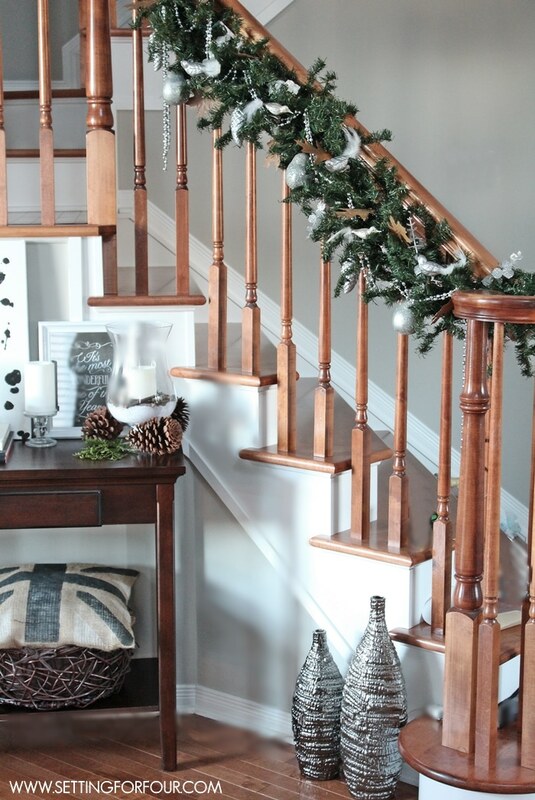 I decorated my stair railing with a winter woodland look as well! Pine garland, silver glittery birds, oak leaves and silver pine cones. I filled a bowl with a few store bought ornaments and ones that I have made! 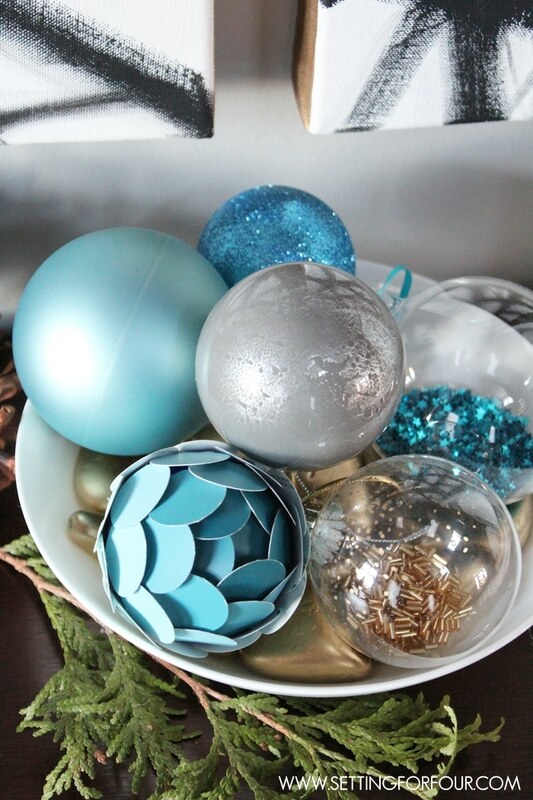 My DIY Ombre Paint Chip Ornament, Gold Beaded Ornament and a DIY mercury glass ornament! Tutorial coming soon for it too! Come into my family room! I’ve kept the winter woodland holiday decor minimal here with some birch candles in silver antler candle holders. 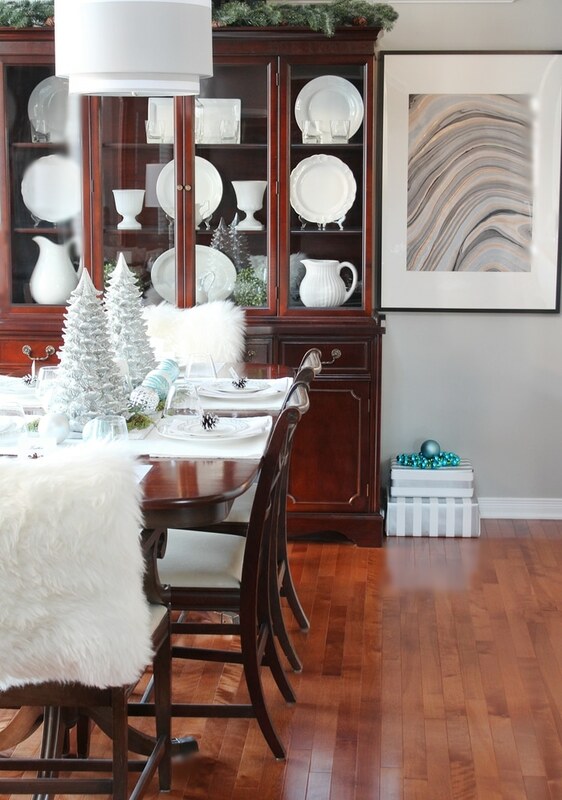 I’ve decorated my dining room with lots of shimmery Winter Woodland Glam decor! 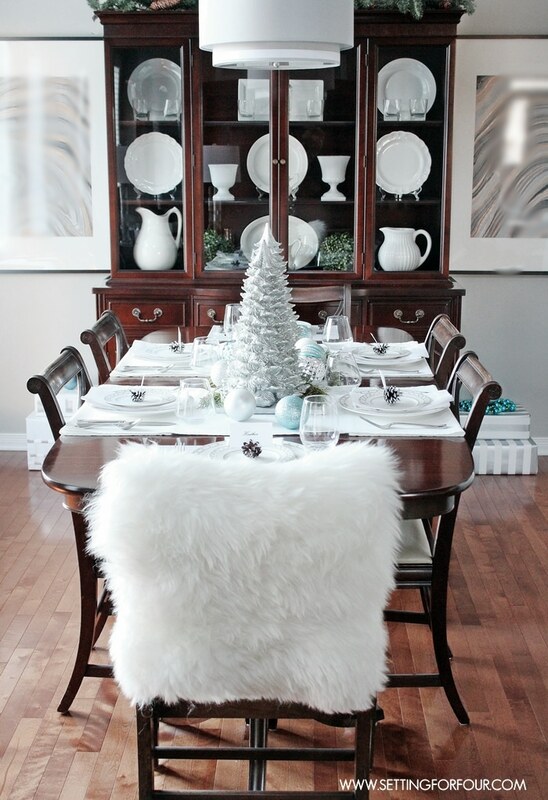 I added some sheepskins to the chairs for cozy texture, a glittery pine garland to the top of the cabinet and created a Winter Woodland Glam Centerpiece. Like my new wall art? It’s sumptuous black, gold and silver marlbed paper handmade in Thailand that I framed! I’m.in.Love! 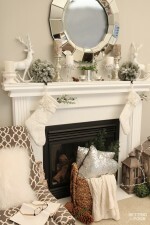 Here’s my Winter Woodland Glam mantel! Lots of glitter and shine! 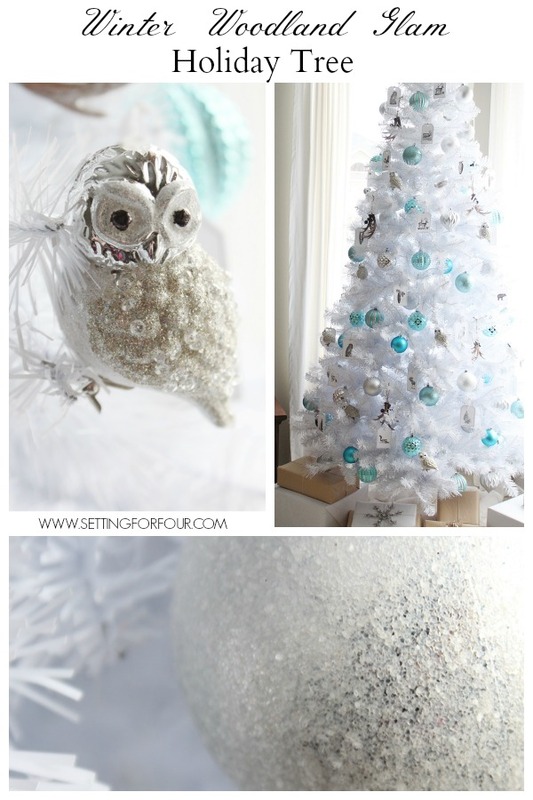 My Winter Woodland Glam Christmas Tree with glittery owls, blue, white and silver ornaments, my DIY Feather Ornaments, more of my DIY Vintage woodland animal tags and antlers. 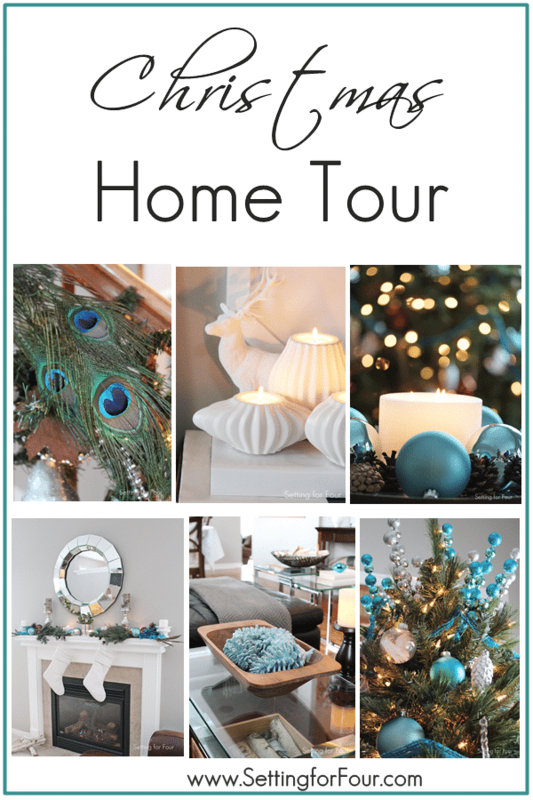 I hope you enjoyed my Winter Woodland Glam Christmas Home Tour! 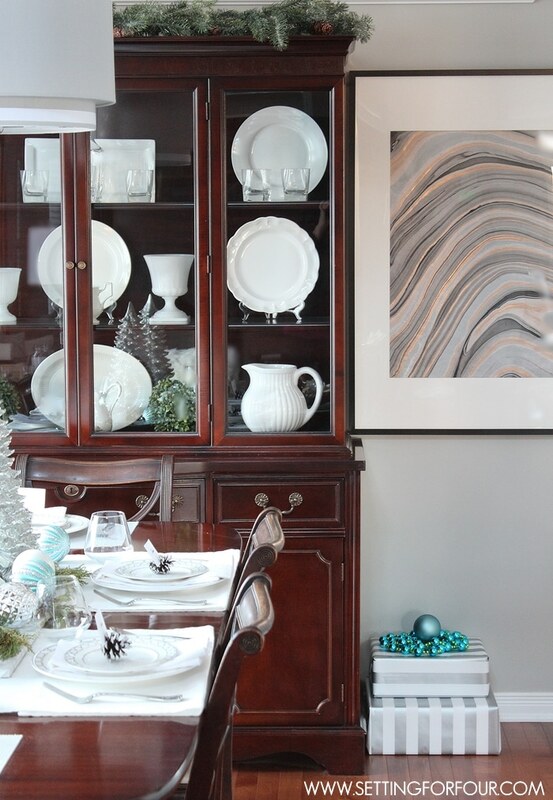 Did you find some holiday decorating inspiration? I hope so!! Now sit tight because I’ve got another big treat for you! 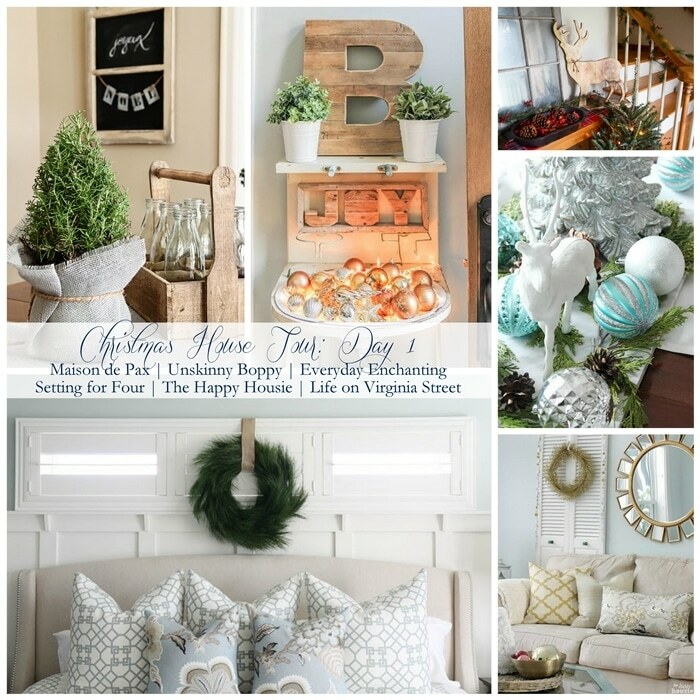 Come join these 28 incredible women as they show off their stunning Holiday homes. 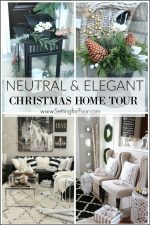 28 homes decked out with gorgeous Christmas decor where you’ll find lots of ideas to pin and add to your home! Want to see more of my Christmas decor? 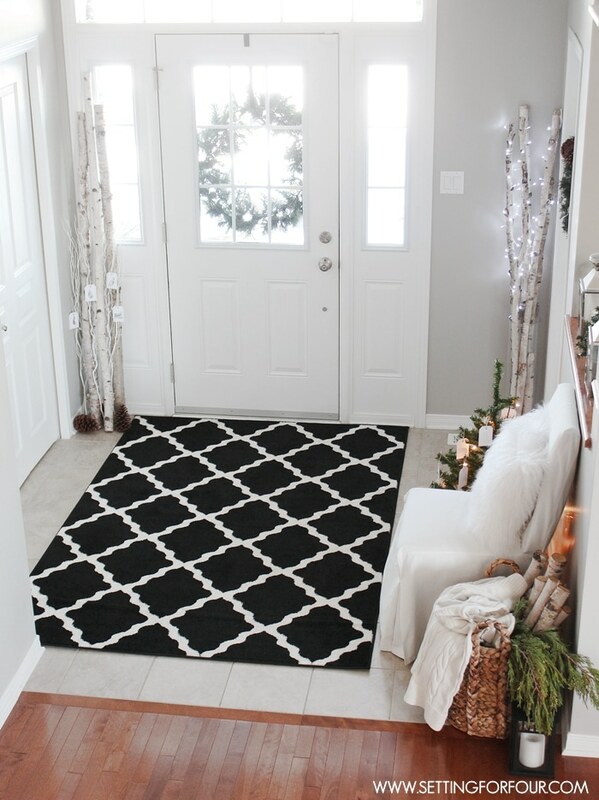 ….and don’t miss my Rugs USA giveaway on now! Everything is gorgeous! Love all the fur and fuzzy in contrast to the shiny. Thanks Kirby for your lovely comments! I love how even your vintage looking tags fit into all the glam!! Thanks Heather!! I love these vintage woodland animal graphics!! These tags cost zero dollars to make too! 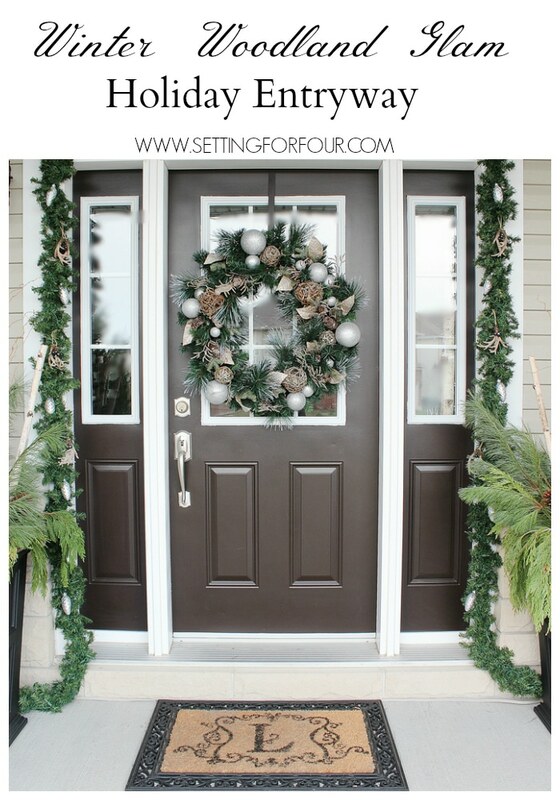 I’m a firm believer that you don’t have to spend tons of money to create a beautifully decorated home for the holidays! Lovely! Love the entryway swag. And those little animal tags? Love the blend of styles. Thanks Meagan for your compliments and for visiting today! Gorgeous. 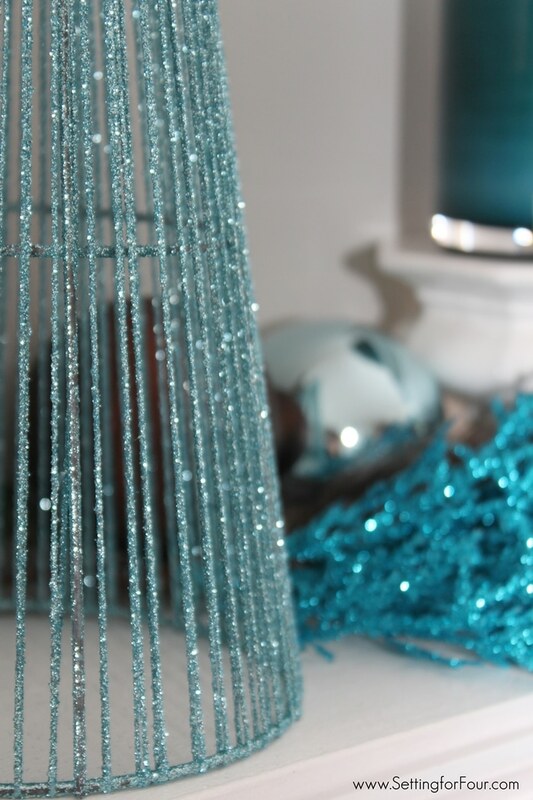 The shimmer of the aqua and white is so beautiful. Heather, you’ve completely outdone yourself. It’s stunning! 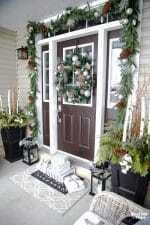 I especially love the birch branches in your entry… Thank you for sharing your home! Thanks for your sweet compliments my friend! 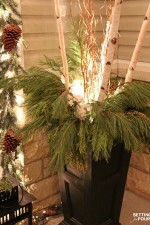 I might have to get hubby to get me more birch from the woods – it really is so pretty! Thanks Shannon!! We are getting 10 inches of snow this week so it’ll be frosty around here for sure lol! Love your theme this year! Everything is so gorgeous. Enjoy your beautiful space! Thanks Jenna Sue for visiting today and Happy Holiday decorating! 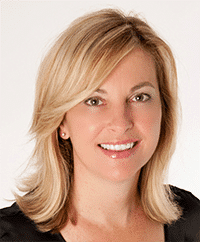 Your home looks absolutely perfect, Heather- I love everything! Especially all of the birch- so pretty! Oh thank you Nina! So sweet of you to say that! 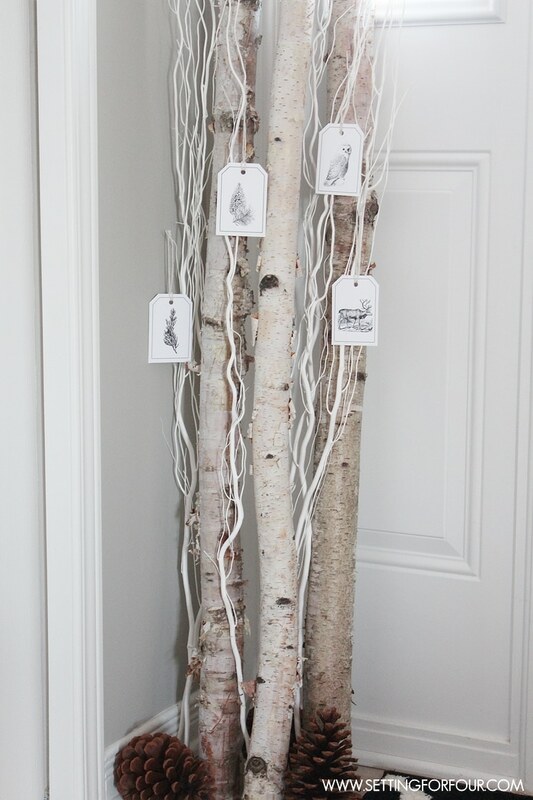 I’m loving all things birch right now…I might even try a birch stencil on a wall! Your home is absolutely beautiful, Heather. I love the glam, yet cozy look! 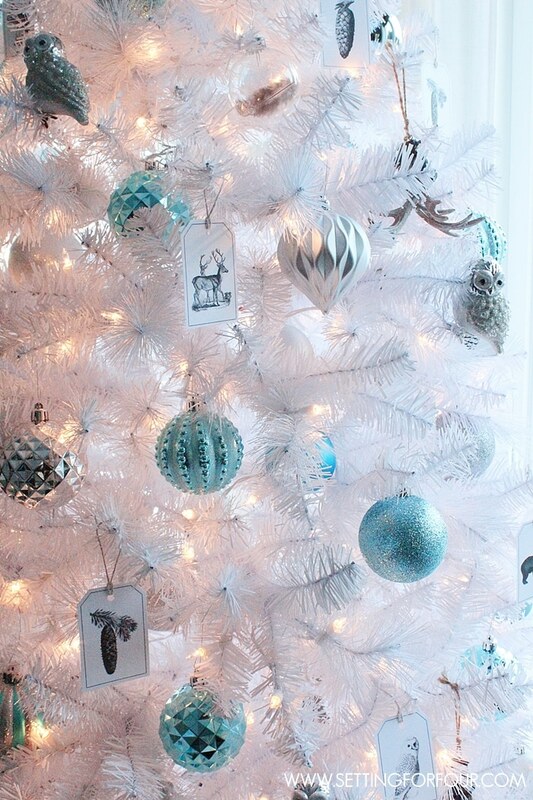 Can I please steal your white tree? 😉 Thanks for sharing your holiday home with us! Your home looks beautiful! I love everything you’ve done. 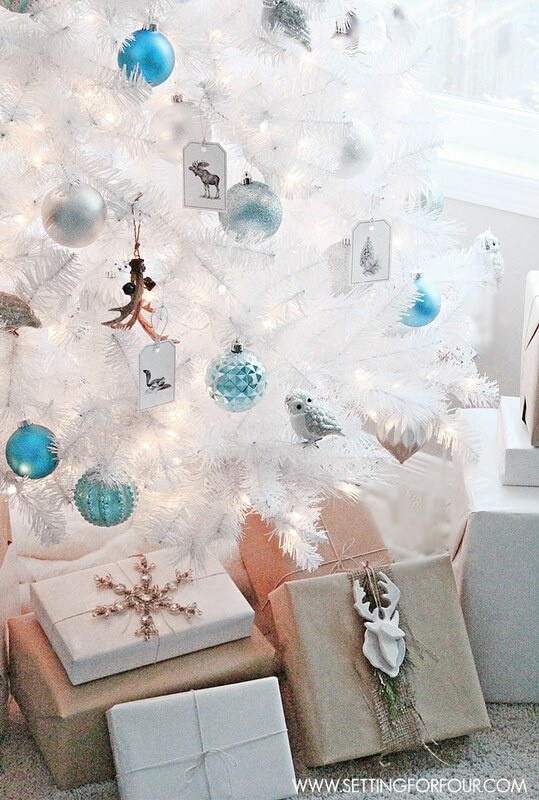 So fun to see some blue Christmas decor! Thanks Erin for your lovely comments!! I’m glad to hear you love blue too! Gorgeous, gorgeous, gorgeous! I love all the furry, fuzzy touches you’ve added! It makes the whole house look so cozy and warm! Merry Christmas! I must say, your home is simply stunning! 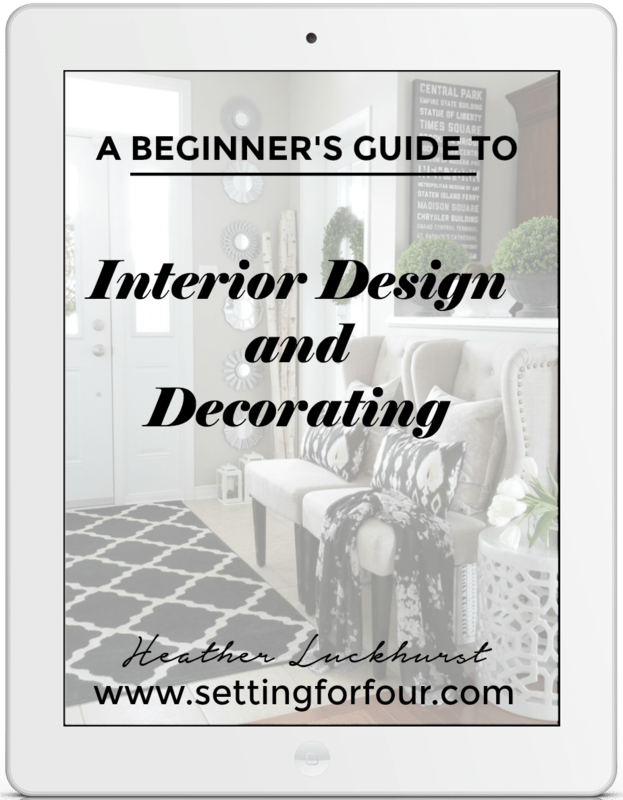 I especially loved your entryway, the framed chalkboard, and the little touches you did all around your home! 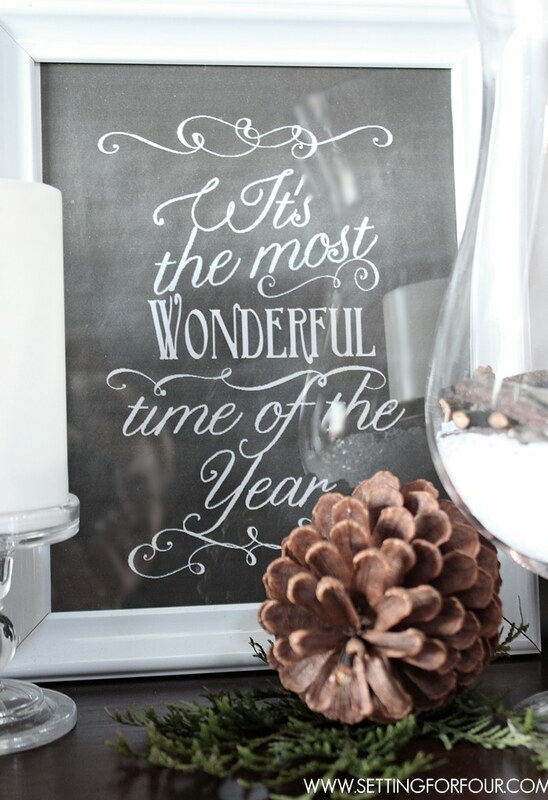 Your home is truly a winter wonderland! SO GLAD TO HAVE YOU BE A PART OF THIS TOUR!!! Thanks Jen for such sweet comments!! I’m so gad to have been a part of this amazing group of talented ladies!! So much inspiration! 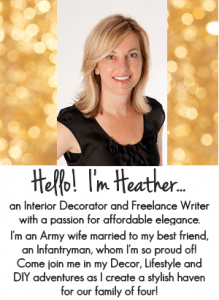 Heather, your decor is gorgeous. I love the way your dining room looks – it’s so bright and fresh. Thank you Tara!! I’m so glad you like my holiday decor! 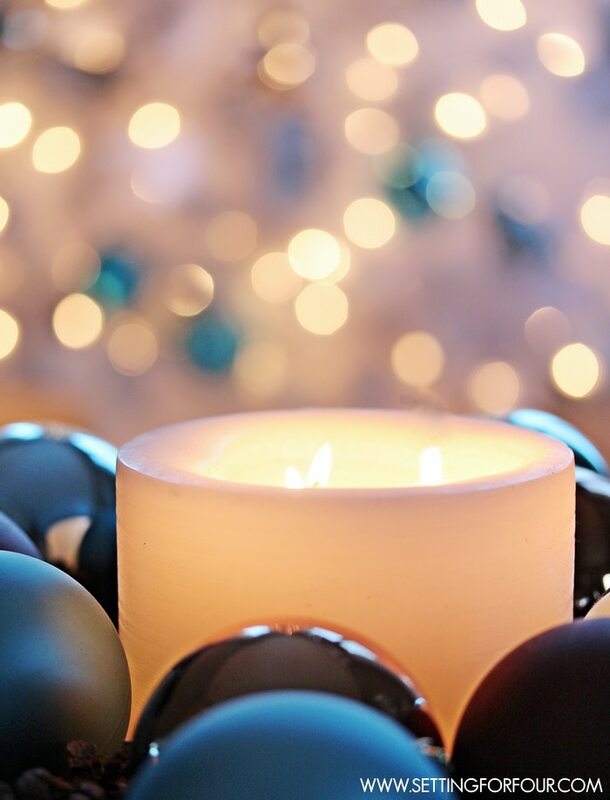 I love Christmas – my favorite holiday! I love the winter wonderland glam theme – its beautiful and fits you perfectly!! 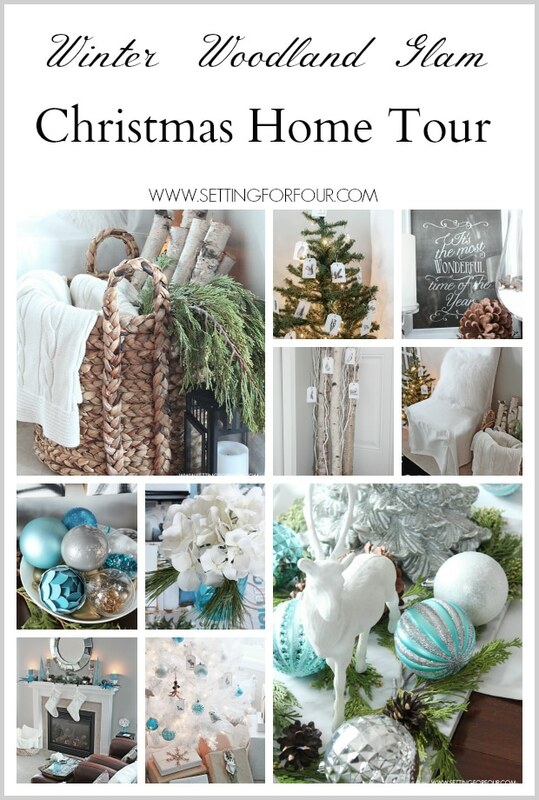 Such a pretty home tour! I just love those woodland animal tags…can’t wait for the tutorial! Heather!! This is stunning. 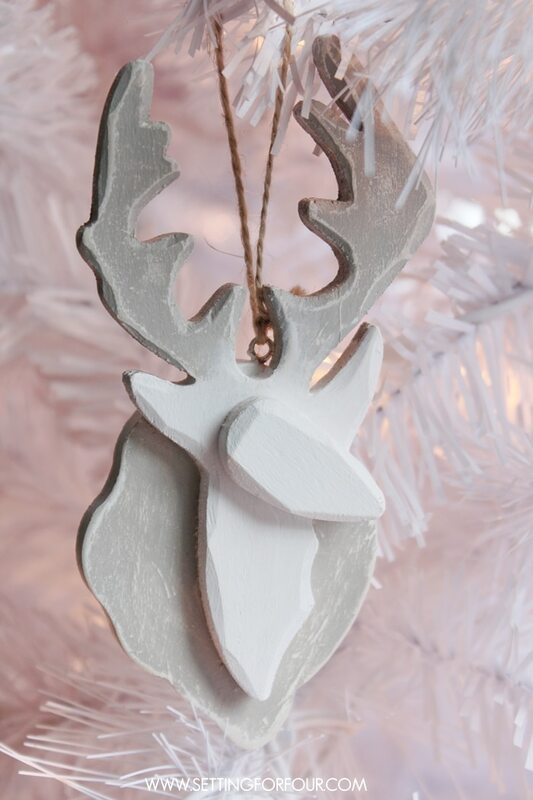 I’m waiting (impatiently) for your DIY woodland creature ornaments. Oh my gosh. 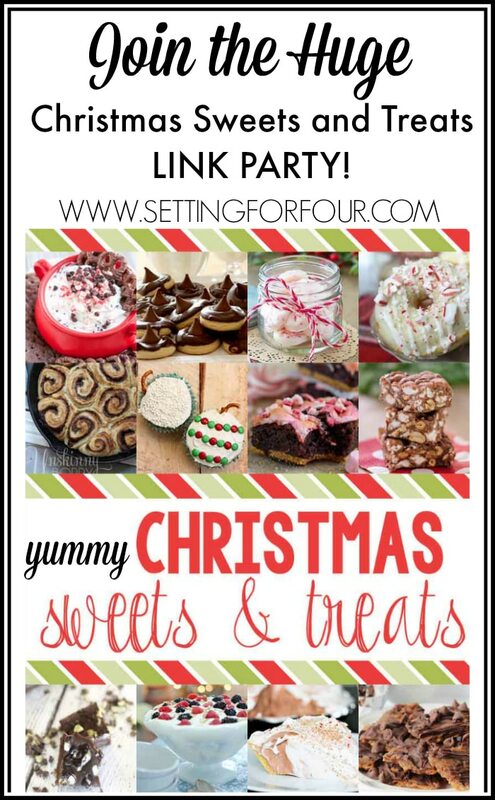 Pinning like mad and sharing on my FB page this weekend. We are definitely on the same wavelength for Christmas decor. I added some of your pics to my Pinterest board for inspiration. 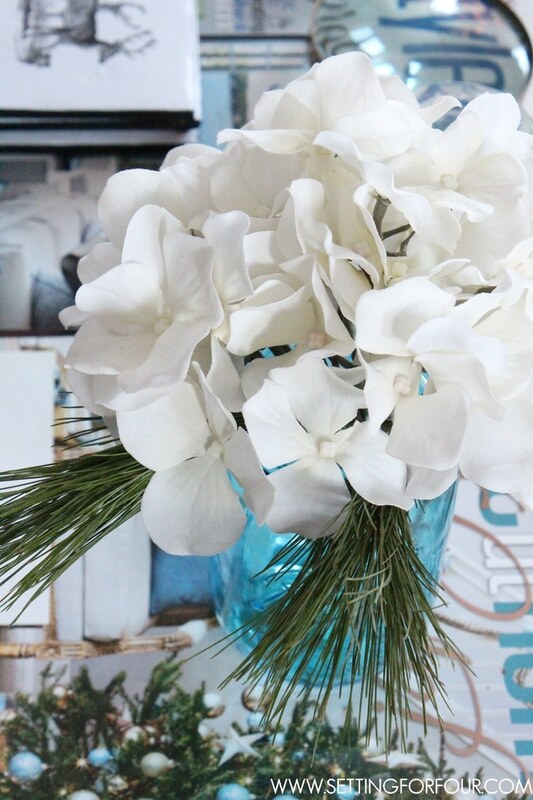 I am loving silver, white, teal, turquoise, and aqua to go along with all of the snowflakes and icicles in this year of the “Frozen” Winter decor. Thanks for pinning Candy!! 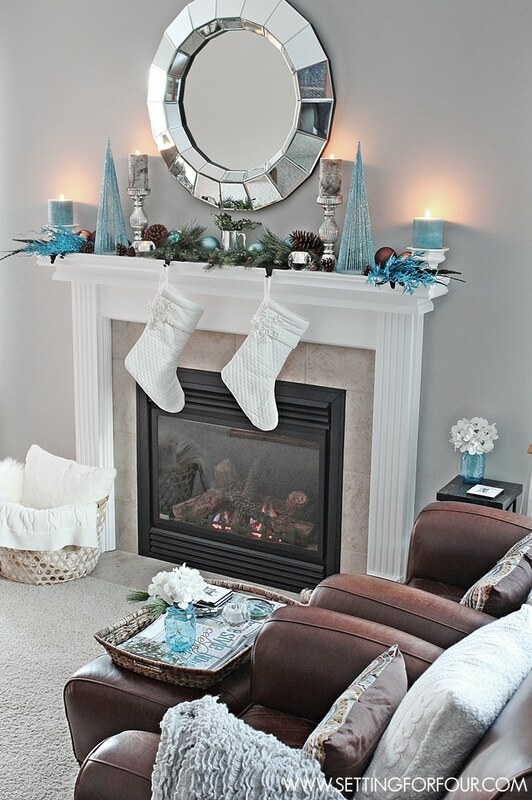 I used to decorate withh traditional red over the holidays but last year switched to blue….our home looks good in blue! 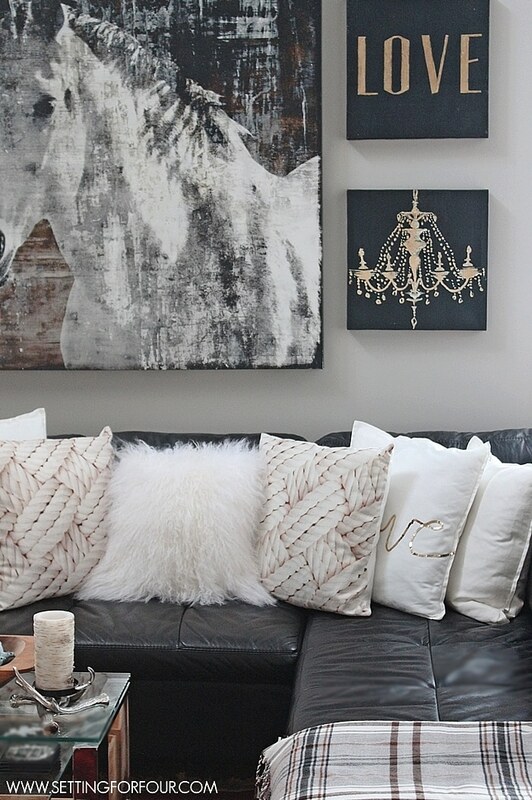 So pretty Heather – love the mix of rustic and glam! I think you are the QUEEN Christmas Ninja Elf, my house wants to be your house when it grows up. Seriously though, it looks absolutely beautiful! Great job! Love it! LOL – thanks Betsy for your compliments – I’m glad you like my holiday decor!!! 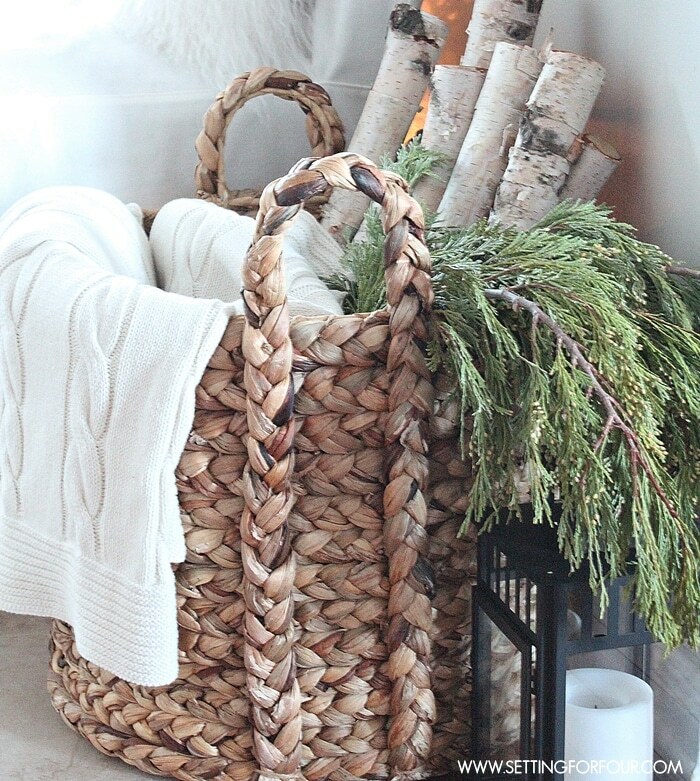 LOVING all your beautiful birch logs and those tag ornaments. So simple and sweet and fun! Everything looks beautiful! I am doing a winter wonderland theme myself. I think it is so classy and glamorous. I was wondering if you know the name and brand of the paint on you front door. It looks sort of black in some of the photos, but I think it is probably a dark brow color. Love it!